I've also been busy making plans! One of the things I'm working on at the moment is expanding the range of designs I offer in custom colours. 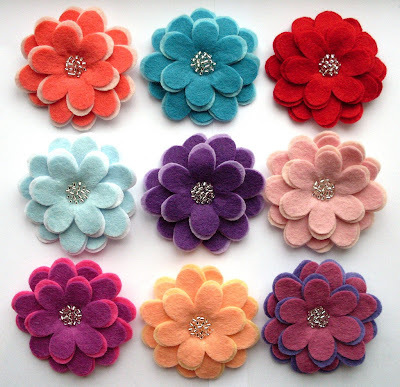 First up, pretty layered felt flower brooches - now available from my Etsy shop or my Folksy shop. These brooches are made up of six layers of soft wool blend felt, with a cluster of sparkly silver seed beads in the centre. As with all my designs, each shape is lovingly cut by hand with scissors from my own hand-drawn pattern piece. 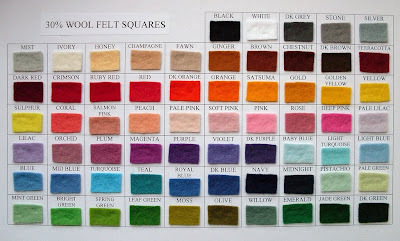 Choose from 65 colours to match your favourite outfit, or order a batch in your chosen colour scheme for the members of your wedding party. Psst - if you want any of the flowers shown, they're currently available in my Etsy shop, and you can see other customisable designs HERE. If you copy and paste this it will take you directly to the page on her blog. I adore your flower brooches, I am the proud owner of one already and once I break out my summer outfits I can see me ordering several more to match them.